An AFO is a device that extends from below the knee down to the foot. It is used for several purposes – to control motion, maintain proper alignment, and reduce instabilities in the lower limbs. Plastic AFOs are mostly custom-fabricated and enclose the bottom of foot and back of the calf. This is done to create a stable structure. Some are made with the ability for ankle movement, while some are not, depending upon the specific conditions. An AFO is worn within a regular, lace-up type of shoe. Who can benefit from using an AFO? Individuals with neurological and orthopedic conditions can benefit from using an AFO. Examples of such neurological conditions: cerebral palsy, multiple sclerosis, and strokes. Examples of such orthopedic conditions: arthritis, fractures, and severe sprains. How often should an AFO be worn? How often you wear it will be base on your specific foot and ankle problem. At the Gentle Foot Care Center, AFO’s are often prescribed for those suffering from this list of painful conditions. Many individuals using an AFO need it to walk pain-free. Dr. Luepschen will instruct you regarding their proper use and care. How do I know if an AFO will help me? Dr. Olga Luepschen utilizes the latest technology when evaluating her patients and will be able to determine if you will benefit from an AFO. 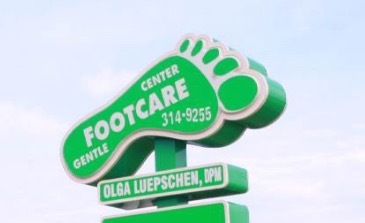 Please call the Gentle Foot Care Center at 863-314-9255 to speak to one of our friendly staff members. We will be glad to answer your questions and help. Most insurances cover the use of an ankle-foot support.